Why is television refusing to catch up to the realities of today? Why is it stuck in a way of being that is a minimum of 20, if not 60 years old? 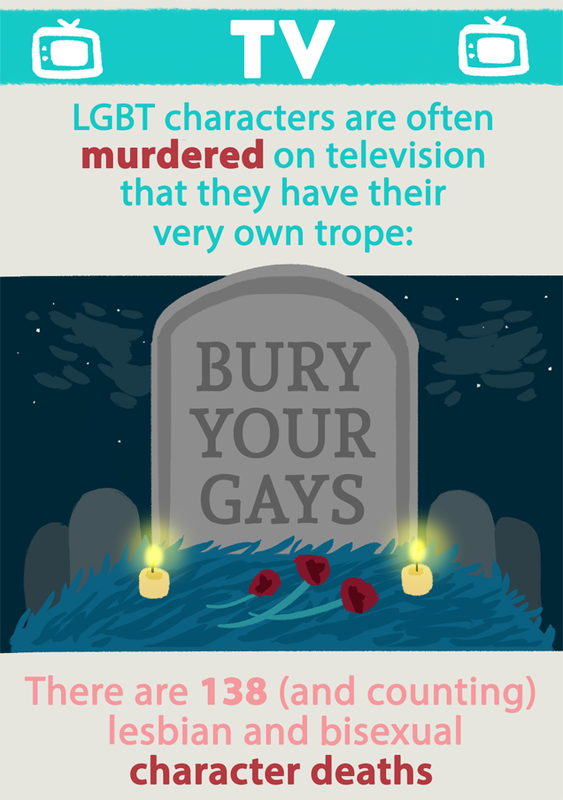 I'm talking about the death of queer characters. 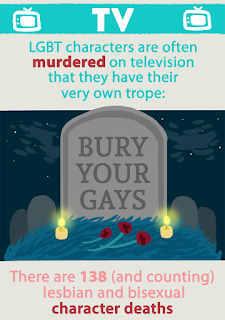 I'm talking about the fact that 18 queer female characters have died on TV this year alone. That's 3 dead every month. Imagine that every time you liked a couple on TV, one of them died. Because that's been what's happened this year. This past week, another lesbian in a popular pairing died, and it hit me like a truck. This is not okay. This cannot keep happening. Queer women dying on TV should not be an assumption. This is not our reality. This is not what we should expect. Stop making the LGBT community watch ourselves die over and over again when the truth is we have a chance for an actual happy ending in our world today. A really good chance. The culture has progressed and yet television stays mired in a world where the girl who likes girls dies, or is quietly shoved offscreen because she might make people who are watching uncomfortable. Media teaches us how to see ourselves and our world. We internalize those messages without meaning to, and it's things like seeing lesbians die over and over again on TV that make you hesitate and look around before holding your girlfriend's hand, or make you combat the feeling that you were built the wrong way. That if you were just built normally, you'd get to be part of the people you watch survive week after week. Television is clinging to the idea that queer people are expendable. That we don't need them for the happy ending; that they were a nice salacious ratings boost, but now that they've served their purpose, they can disappear. This is not our reality. Catch up, TV.